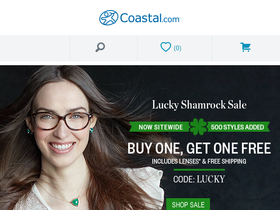 Coastal.com, online as coastal.com, is the go to shop for contact lenses, eyeglasses, and more. Before shopping at Coastal.com, be sure to stop by RetailSteal.com for the latest Coastal.com coupon codes, Coastal.com promo codes, and Coastal.com deals. Coastal.com carries contact lenses, designer eyeglasses, sunglasses, lenses, and more. Coastal.com carries top brands such as Ray-Ban, Michael Kors, Oakley, Calvin Klein, and more. Coastal.com offers shipping promos that change often. Stop by RetailSteal.com for the latest Coastal.com shipping special offers. Use code at Coastal.com and save $30 on glasses orders $100+. Click here for code. Use code at Coastal.com and save $15 on contact lens orders $80+. Save 40% on exclusive brand frames with this code at Coastal.com. Use code at Coastal.com and save 35% on frames, lenses, and contacts. Use code at Coastal.com and save 30% on frames. Use code at Coastal.com and save 15% on Acuvue contacts. Use code at Coastal.com and enjoy free shipping on contact lens orders $49+. Click here for code. Enjoy free shipping on all glasses at Coastal.com.